Located in southern Gila County in south central Arizona approximately 90 miles east of Phoenix, 20 miles south of Globe, the Gila County seat, and 85 miles north of Tucson. Access is by State Highway 77 and Parcels 1 has direct access from this highway. The headquarters is in Parcel 1 on Cactus Run Road one mile south of Highway 77. Parcel 2 is accessible from Dripping Springs Road by a jeep road. The other 2 parcels do not have vehicular access. This property contains a total of 1,327 acres lying in 4 separate parcels. Parcel 1 consists of 1,126 acres. Improvements on this parcel include a 1,970 doublewide/additions containing 1,822 sq ft, 7 rooms, 2 baths, a 680 sq ft concrete block tack house, 40ftx24ft wood pole hay shed, 40ftx48ft steel frame hay shed, and two truck trailer storage units. These improvements are in fair to poor condition. Utilities include electricity, water by submersible pump, and sewer by septic. Dripping Springs Wash runs southeasterly through the southern portion of this parcel. Spring Creek runs south through the northern portion of the parcel into Dripping Springs Wash in the middle or the parcel. The majority of the parcel lies along these washes at elevations from 2,400 to 2,500 feet. 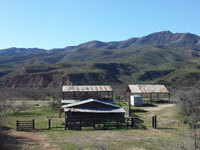 The foothills of Dripping Springs Mountain in the southern edge of the parcel rise to 2,640 feet. The elevation at the house is approximately 2,420 feet. Historically there have been several small sprinkler irrigated pastures along Dripping Springs Wash which runs diagonally across the south end of the parcel. 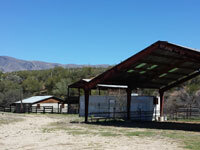 Water for the sprinklers was supplied by two wells, one of which is registered by the Arizona Department of Water Resources. 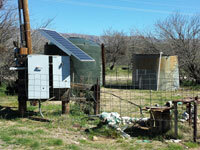 These two wells are now equipped with submersible pumps used for domestic and stock water. In addition there are two other registered irrigation wells on the parcel, one with no equipment and one that has been abandoned. The parcel is not in an ADWR Active Management Area. Parcel 2 consists of 80 acres. Dripping Springs wash runs southeasterly across the middle of the parcel. A power line crosses the parcel. It has a flat topography. 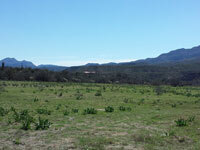 It is accessible from the Dripping Springs road by ½ mile of jeep road. Parcels 3 and 4 consist of 40 and 80 acres respectively. 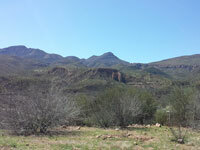 They lie in the Dripping Springs Mountains and have mountainous terrain. Arizona Department of Water Resources records include a Certified Water Right for a spring on each parcel. The status of these springs is unknown. There is no vehicular access to these parcels. 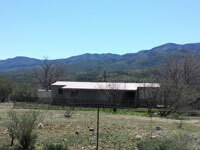 The Gila County zoning for the property is GU- General Unclassified. This is the County's zoning for properties in unincorporated areas not otherwise designated for other specific zoning. Please click here to download (about 7 MB) a printable, brochure in Adobe Acrobat format. If you get frustrated trying to make this work on your computer, don't hesitate to ask us to mail you a printed and bound brochure instead.